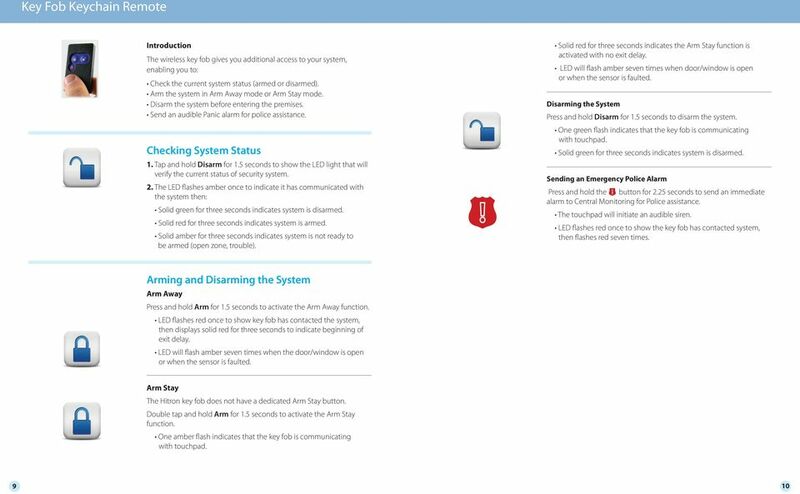 Download "Welcome to a whole new level of interactive home security"
3 TouchScreen System Status Icons The various user interfaces include the following icons that provide an at-a-glance overview of the status of your system. 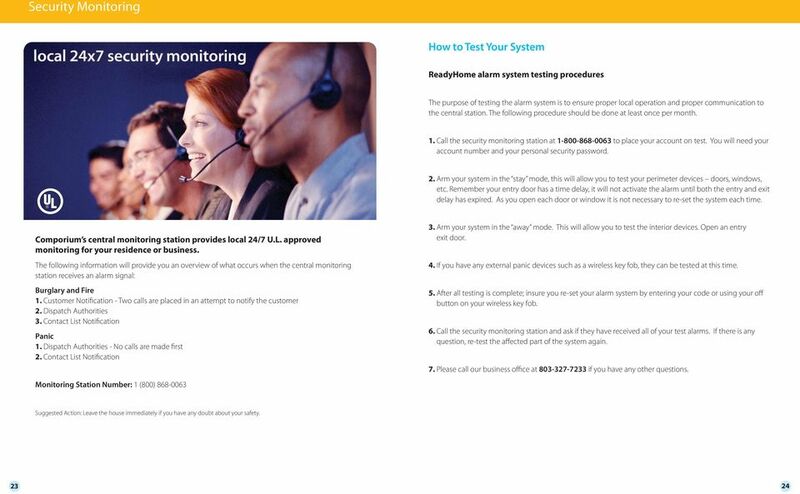 The Security status of your security system is displayed in the large Security Status header. Introduction The interactive TouchScreen acts as the control center that enables you to operate your security system and interact with your home at the touch of a button. Use it to arm and disarm your system, view live video from cameras placed in your home and view real-time web content all from the full-color display. 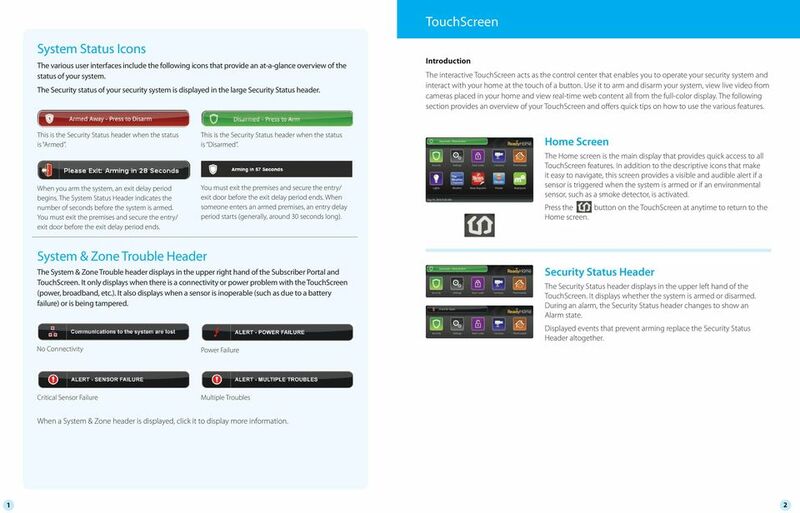 The following section provides an overview of your TouchScreen and offers quick tips on how to use the various features. This is the Security Status header when the status is Armed. When you arm the system, an exit delay period begins. The System Status Header indicates the number of seconds before the system is armed. You must exit the premises and secure the entry/ exit door before the exit delay period ends. This is the Security Status header when the status is Disarmed. You must exit the premises and secure the entry/ exit door before the exit delay period ends. When someone enters an armed premises, an entry delay period starts (generally, around 0 seconds long). Home Screen The Home screen is the main display that provides quick access to all TouchScreen features. In addition to the descriptive icons that make it easy to navigate, this screen provides a visible and audible alert if a sensor is triggered when the system is armed or if an environmental sensor, such as a smoke detector, is activated. Press the button on the TouchScreen at anytime to return to the Home screen. System & Zone Trouble Header The System & Zone Trouble header displays in the upper right hand of the Subscriber Portal and TouchScreen. It only displays when there is a connectivity or power problem with the TouchScreen (power, broadband, etc.). It also displays when a sensor is inoperable (such as due to a battery failure) or is being tampered. No Connectivity Power Failure Security Status Header The Security Status header displays in the upper left hand of the TouchScreen. It displays whether the system is armed or disarmed. During an alarm, the Security Status header changes to show an Alarm state. Displayed events that prevent arming replace the Security Status Header altogether. Critical Sensor Failure Multiple Troubles When a System & Zone header is displayed, click it to display more information. 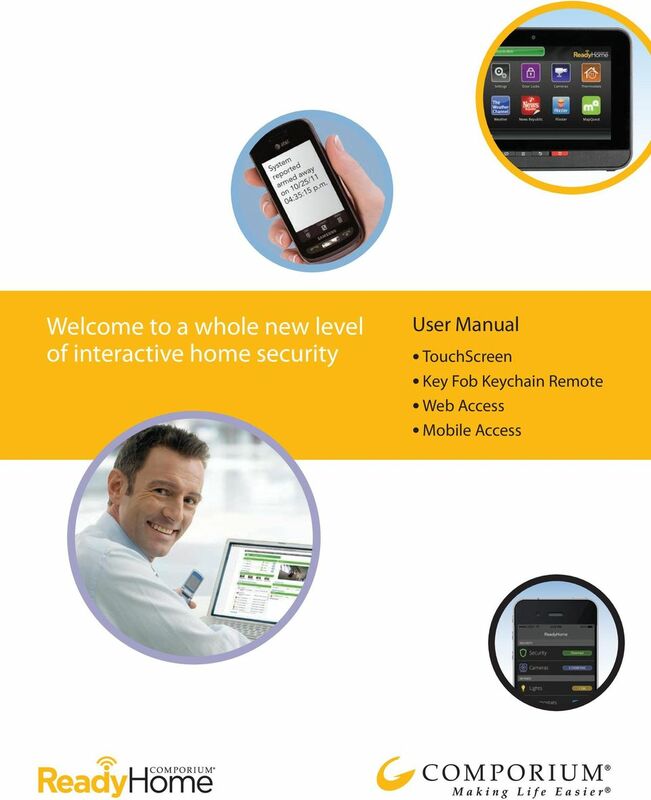 8 Web Access Introduction Access your interactive home security system through your personal, secure web page. Check the status of your home, arm and disarm your system, see live video of your home, view video clips and pictures, change settings and much more from anywhere you have Internet access. Signing In You will need to sign in each time you access the website.. Go to Enter your username and password.. Click Sign In. Security Indicates the overall status of your security system. To arm a disarmed system:. Click the Security Status header when it is in the Disarmed state. Or select Security > Arm on the toolbar.. If any security zones are currently faulted, preventing the system from being armed, you must click the Turn Zone Off button for that zone before arming the system.. Select the Arming Mode. Arm Away Everyone is leaving the house. Arm Stay There are still people in the premises. Main Tab The Main tab provides a snapshot overview of your entire system. From this page, you can view general status information about your home and security system, and access various tabs to change system settings. See Pages Arm Night Everyone is going to bed. This mode works the same as Arm Stay except that there is no Entry Delay period. If an entry/ exit zone is opened, an alarm sounds immediately. 4. Enter your 4-digit security code. 5. Click Arm Now. See Pages - See Page 4 5 To disarm the system:. Click the Security Status header when it is in the Armed state. 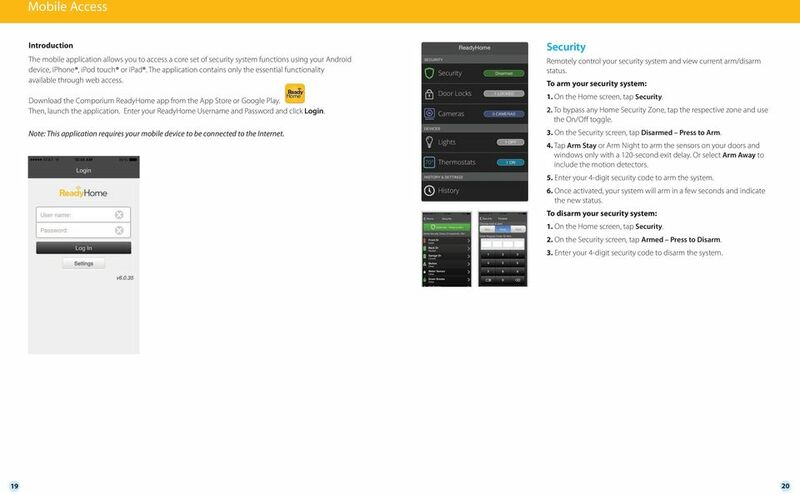 Or select Security > Disarm on the toolbar.. Enter your 4-digit security code, and click Disarm. To manage other security settings, click Security on the toolbar. 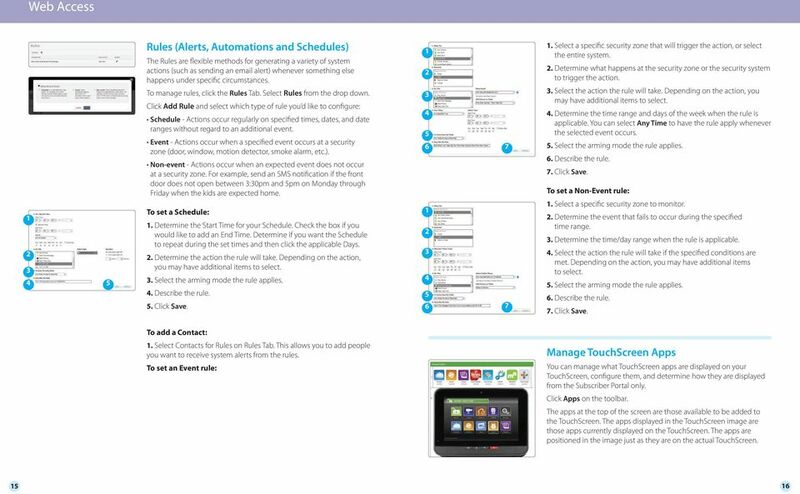 See Page 8 Managing Keypad Codes Keypad codes are used to arm or disarm the system. Multiple keypad codes can be assigned to track who enters and leaves the premises. To manage keypad access codes, select Security > Keypad Codes on the toolbar and add a new access code or modify current access codes. 13 Mobile Access Cameras View live video or captured pictures and video clips. To view live video from your cameras:. On the Home screen, tap Cameras.. From the list, tap the camera you d like to access. Live video will appear for that respective camera. 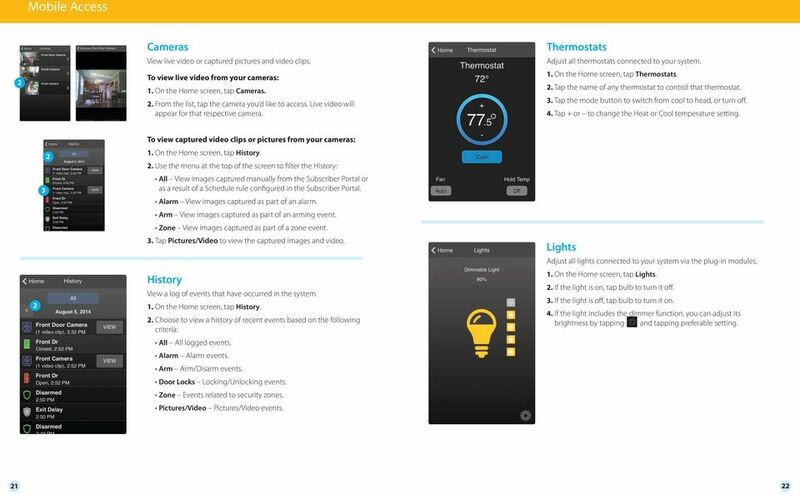 Thermostats Adjust all thermostats connected to your system.. On the Home screen, tap Thermostats.. 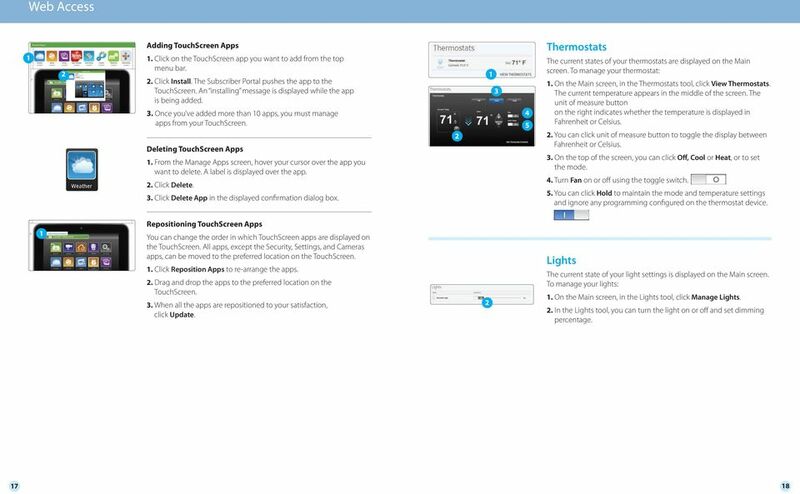 Tap the name of any thermostat to control that thermostat.. Tap the mode button to switch from cool to head, or turn off. 4. Tap + or to change the Heat or Cool temperature setting. 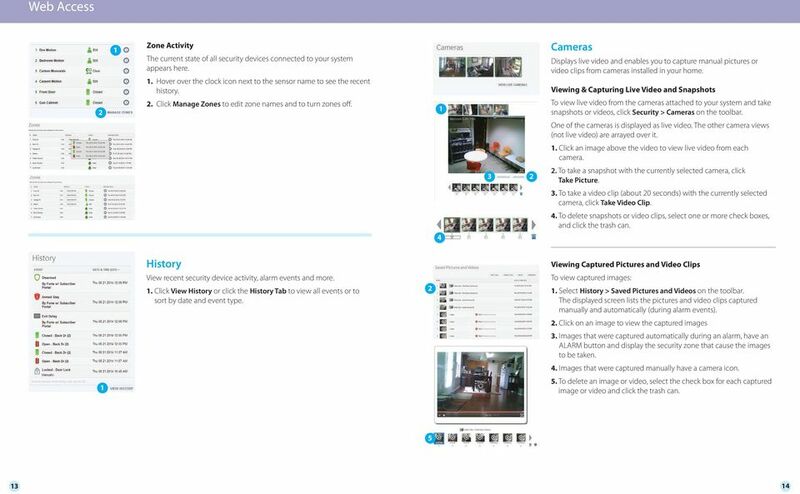 To view captured video clips or pictures from your cameras:. 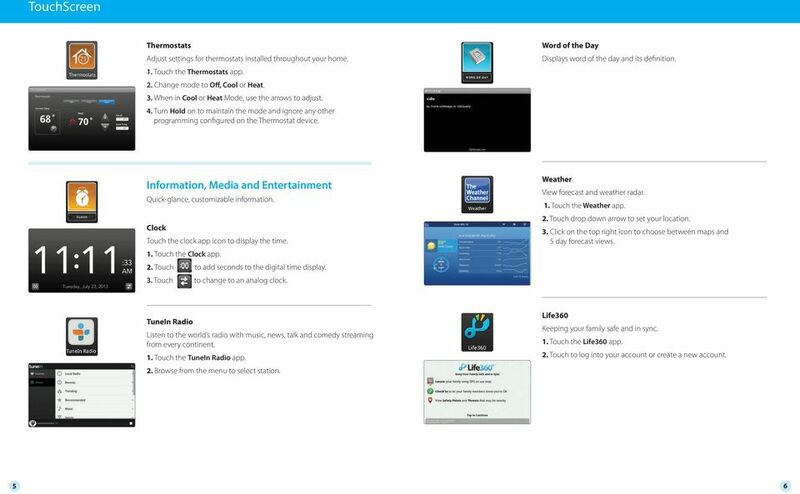 On the Home screen, tap History.. Use the menu at the top of the screen to filter the History: All View images captured manually from the Subscriber Portal or as a result of a Schedule rule configured in the Subscriber Portal. Alarm View images captured as part of an alarm. Arm View images captured as part of an arming event. Zone View images captured as part of a zone event.. Tap Pictures/Video to view the captured images and video. 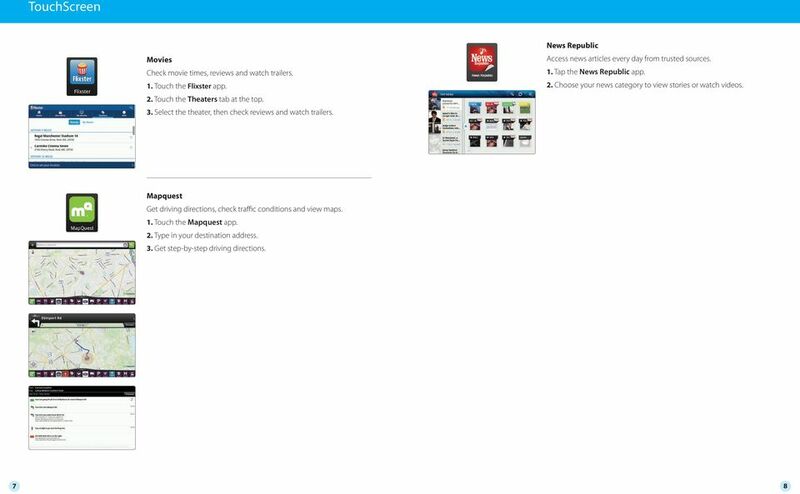 History View a log of events that have occurred in the system.. On the Home screen, tap History.. Choose to view a history of recent events based on the following criteria: All All logged events. Alarm Alarm events. Arm Arm/Disarm events. Door Locks Locking/Unlocking events. Zone Events related to security zones. Pictures/Video Pictures/Video events. Lights Adjust all lights connected to your system via the plug-in modules.. On the Home screen, tap Lights.. If the light is on, tap bulb to turn it off.. If the light is off, tap bulb to turn it on. 4. If the light includes the dimmer function, you can adjust its brightness by tapping and tapping preferable setting. Welcome to a whole new level of interactive home security. Protect and connect. Home and away. 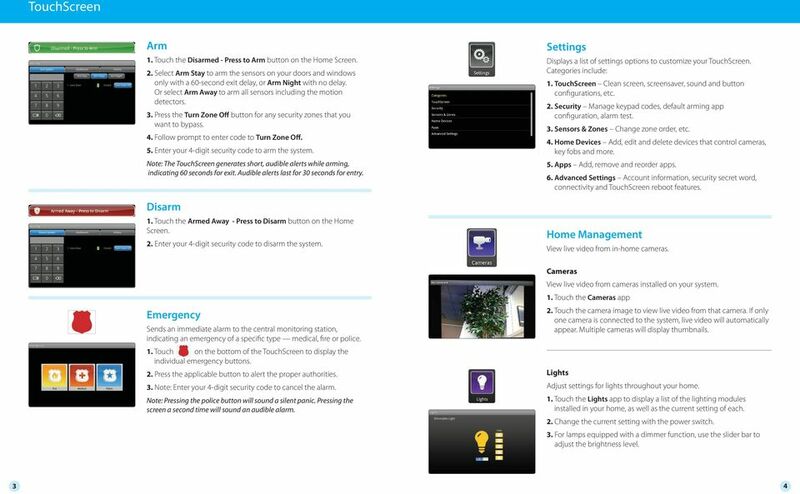 XFINITY HOME SECURITY User Manual WELCOME TO XFINITY HOME SECURITY Whether you re home or away at work or on the go XFINITY Home Security makes it easy for you to stay connected to your home and family. YOUR INTERACTIVE SECURITY MyFrontpoint.com: Setup & Features SECURITY THE WAY YOU WANT IT After your activation call, you ll receive your MyFrontpoint.com login and password via email. Log on at www.myfrontpoint.com. 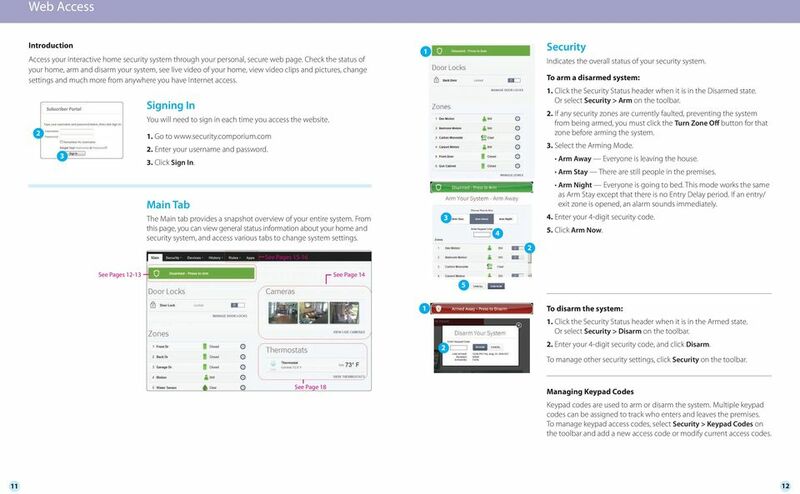 User Manual December 2014 202-11380-01 NETGEAR, Inc. 350 East Plumeria Drive San Jose, CA 95134, USA Support For product updates and web support, visit http://support.arlo.com. Trademarks NETGEAR, Inc. Welcome to a whole new level of interactive home monitoring. 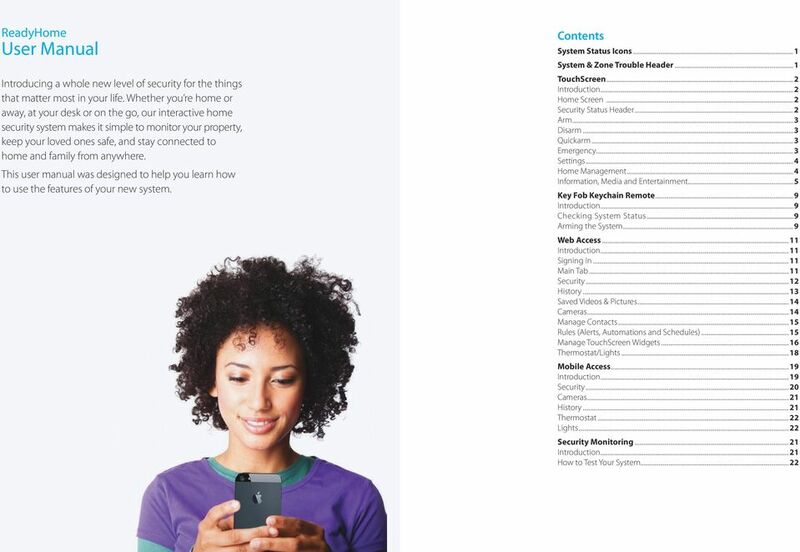 CenturyLink Smart Home AT HOME > Quick Start Guide ON THE WEB ON THE GO CenturyLink Smart Home Quick Start User Guide Introducing a whole new level of security for the things that matter most in your life. User's Guide. [Home Network] app. Model No. Again, thank you for becoming a LifeShield customer. We will continue to do everything we can to make sure you, your home and your family are safe. LYNX Touch 5100 GRAPHIC TOUCHSCREEN WITH 4G/WI-FI COMMUNICATIONS, ANDROID TABLET AND Z-WAVE AUTOMATION. A Brilliant Way to Build Your Business! Hints for use: After logging in, hit F11 to toggle full screen mode. Hover over icons for tool tip help. 800-08936V2 10/03/2012 Rev. Simon XT User Manual 600-1054-95R-11 and 600-1054-95R-11-CN P/N 466-2266-02 REV B ISS 13JAN11 Copyright Trademarks and patents Manufacturer FCC compliance Contact information 2011 UTC Fire & Security.